the new sizes and Limited Editions. unique in the current range of Cuban cigars. Until we have obtained clarity on these points we have removed the “BUY NOW” option from all pure tobacco products on the website. 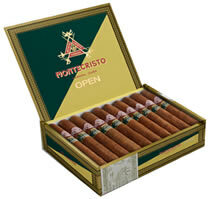 The Montecristo Open cigar range is designed to appeal to the younger smoker, the new smoker, the occasional smoker, the smoker who requires a lighter, easier-burning cigar – but with the same great Cuban taste. The “OPEN” range was first presented to the public at the 2009 Habanos Festival in Cuba. An aside: Three months later the first 18-hole international Montecristo Cup Open Golf Tournament was played at the Varadero Golf Club in Cuba with Ernie Els as the guest of honour and to present the prizes. The Montecristo Open Cigars carry the normal Montecristo band, with an additional green and gold “OPEN” band with the name of the Vitola (size) printed on it. 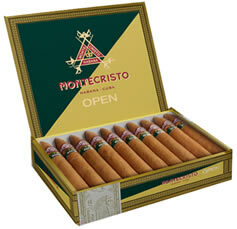 Packed in Boxes of 20 with the Montecristo branding on a diagonally divided green and gold background. REGATA – 135mm x Ring 49 – the Pyramid shape, the smallest we know of, even smaller than a Bolivar Belicosos. “The entire line shows these hay flavours combined with a certain yet very light sweet aftertaste ……… “green” aromas, - like some herbs, a gentle mint taste etc etc …. My first impression on opening the boxes was “What great-looking cigars”. The colour is a nice medium brown, and the leaf is smooth and glossy on the Eagle and the Junior. The wrapper on the Master was a little rough looking, so I chose to smoke that first – and what an enjoyable introduction to the range. 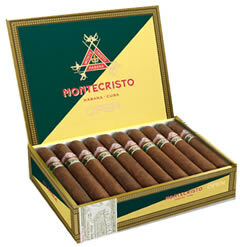 All the flavour is there, but not as intense as the original Montecristo. It burned a little unevenly at first, but it soon sorted itself out, and the excellent construction was shown by the length of the ash. It smoked smooth to the end, definitely a must-smoke-again experience. I’m looking forward to the other three.